It looks like you don’t have an account with Roadtrip Nation Education. Are you a student? Click here to create your account. Need help? Send us a message! Are you a student? Click here to create your account. Our project-based programs use a blended learning format to foster authentic career exploration through interactive lessons and engaging multimedia content. All Roadtrip Nation educational programs include full access to our Interview Archive, a growing video library of interviews with professionals of all kinds discussing work and life. Thousands of career stories that illuminate diverse pathways and careers, from scientists to CEOs, sports journalists to designers. Students can browse our library of video interviews by the interests and themes that matter most to them. Personalize career exploration with The Roadmap, an interactive online tool that allows students to select their unique combination of interests and discover related real-world careers. 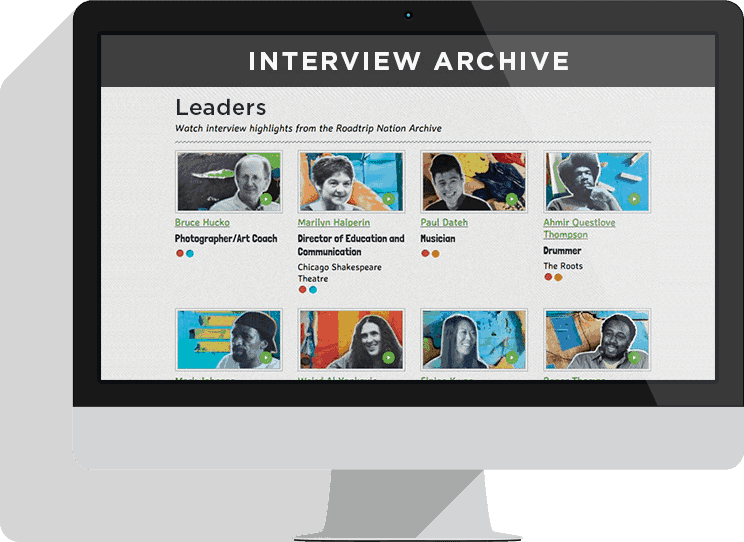 Get the full Interview Archive, included with our programs, or purchase standalone subscriptions for your students. Roadtrip Nation students finished the program with the mindset “I can do better” and earned a higher average GPA than comparison students, improving their average GPA compared to peers by a factor of two. Learn more about the impact of Roadtrip Nation programs, which were shown to significantly increase students’ self-efficacy and raise average GPA.